Once upon a time, there was a magnificent beast. Its form called out the very pinnacle of power, virility, and regal presence. From its image, we create mascots for our sporting events and even have worshiped it as a deity and spiritual influence, praying for its blessings of abundance, replenishment, fast healing, passion and strength, and the quick path to a fertile summer. We speak of the mighty bull, the signature animal of Taurus, the minotaur, and any number of other creatures of power and rugged stamina. Of course, others might shift their eyes and wonder for a long moment, asking, “Er… aren’t you just talking about a male cow?” And, it does take a moment to think. A cow isn’t quite impressive… a creature known for standing around in the field, chewing already digested grass and waiting to be tugged on by some farmers for a healthy dose of milk. The male, then, isn’t even used for that. Obviously they help the process of making more cows, which might lend to some definitions of virility, but we’re not sure that is what is meant to be inferred by their function as mascots. So, perhaps they sometimes look a bit goofy… They still should be considered as majestic and powerful. To that end, we offer you this astounding and regal… (Oh. We’re out of regal? Really?) 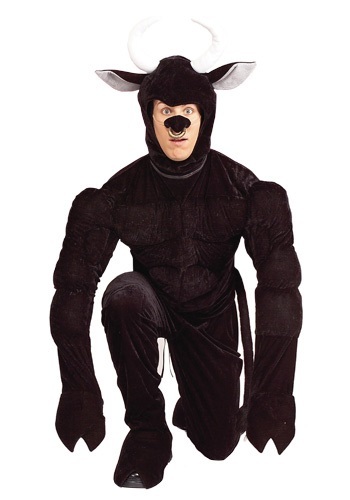 *ahem* To that end, we… er… offer you this Toro the Terri-Bull costume! This long sleeved shirt ties in the back and offers you padded arms that could probably look like muscles and a pullover hood with ears that are… frankly freaking adorable. The elastic bull nose is pierced and hoof attachments for your wrist and ankles will finish the transformation. You might not be frightening any wanderers away from your labyrinth or leading the team to victory, but you will certainly bring some much needed joy and frivolity to the party or give a decent Matador a double-take. And, for virility? Well, who knows what the night may bring.